• Made of 100% Technaline® cowhide – waterproof leather. 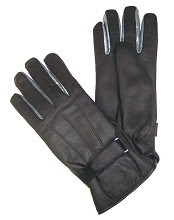 • Leather is 1.0 millimeter thick vs .6 – .8 mm for most gloves. • Soft as a baby’s bottom! • Conforms to your hands, doesn’t loosen with wear. • Comes in lined, lightly lined, and unlined. • Styles include full-finger, fingerless, perforated and cut-away. • Gel palm and some versions have velcro fastener. Why I was looking for a new pair of gloves If there’s one thing I enjoy it’s a good pair of gloves. Now, I’d had my River Road full-finger gloves for about three years, and they’d served me well, but one last day in the rain put them out to pasture. They’d gone from a rich black sheen to some sort of sunbleached milky grey colour, with little left in the velcro closure in terms of closure. I’m big on sticking with brands that work, so I thought I might luck onto another pair. How I found my Hugger Gloves As I rummaged through the dealer rack, I noticed a very soft looking pair of basic gloves that didn’t seem to have the standard HD paraphernalia of roses, sparkles or lace (all ideal for riding by the way – the guys don’t know what they’re missing). They claimed to be waterproof – not water resistant – waterproof. Since they were only $35.00, I thought I’d give them a try. I will say this for Hugger Motorcycle Gloves, they’re not a bunch of liars. These might be the most comfortable gloves I’ve worn. I rode through at least two thunderstorms in them, packed them in my bag at night, pulled them out the next morning, and you would have never known they had even gotten wet. • Go with the most close-fitting size. They’ll stretch, conforming to your hand. • The cut-away version looked interesting, but they didn’t have my size. Next trip! • These gloves don’t make claims they can’t keep.